UPDATE: Giveaway has ended, and winner was chosen by random.org. Congrats to Sara T. on winning a free Milk Paint Basics Workshop registration! ************* We keep posting on Facebook about milk paint. You want to know what it's all about, and if it really involves milk. We offer workshops for just such Q&A, as well as hands-on time to play with and learn about the paint. The outcome? You, with confidence, going home and painting furniture. Don't blame us if Grandma gets mad at you for painting her antique dresser.... Click below to enter for a free Milk Paint Basics workshop. 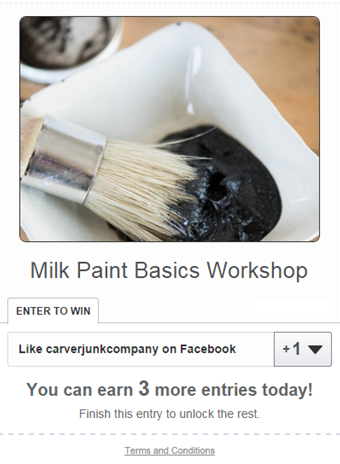 We hold workshops at least once monthly, and the winner will receive a voucher for one (1) spot in any regularly scheduled Milk Paint Basics workshop at Carver Junk Company, good until March 31st, 2015! We won't keep you hanging about that milk question. The answer is YES! Milk Paint actually has milk in it! Check out our Milk Paint FAQs page for more info.